This is it! This is the easiest Roast Chicken ever! Leave it to Mark Bittman to make it simple and tasty! I wouldn’t have thought that I needed another Mark Bittman cookbook, but I couldn’t resist buying his hot-off-the-presses How to Cook Everything the Basics: All You Need to Make Great Food – With 1,000 Photos. Even though I already know my way around the kitchen, this book has a lot of appeal for me. The photos are gorgeous and really make me want to try the recipes. And, no doubt, I’ll learn a thing or two, like this easy method for roasting chicken! Don’t expect to find recipes for how to cook everything in this new book. He wrote How to Cook Everything for that, and it’s one of my favorite cookbooks. How to Cook Everything the Basics’ focus is on the techniques that are needed to cook everything. Mark gives simple instructions for each technique and the beautiful photos clearly illustrate the lessons. The recipes demonstrate how to use the techniques. So I decided to try his Roast Chicken. Could it really be this simple to make the perfect roast chicken? Yes! There’s no basting, turning the bird, or temperature changes involved. And yet, my chicken had crisp skin, perfectly cooked dark meat and breast meat that was not overcooked. According to Mark, the secret is the hot pan. Putting the chicken breast-side up in a sizzling hot pan enables the dark meat to cook more quickly, so the whole chicken is evenly cooked. This is a terrific method for Roast Chicken! I’m looking forward to learning another thing or two from my new How to Cook Everything the Basics cookbook! 1. Preheat the oven to 400˚ with the oven rack placed in the lower third of the oven. 2. When the oven has reached 400 ˚, put a 12-inch cast iron (or other heavy oven-proof) skillet in the oven to heat for 10 – 15 minutes. 3. While the pan heats, wipe the chicken dry with paper towels. Rub the oil all over the outside of the chicken and sprinkle generously with salt and pepper. 4. When the pan is heated, carefully put the chicken in the pan, breast-side up. 6. Check the chicken. When done, the thickest part of the thigh should register 165˚. Alternatively, tilt the chicken and the juices running from the inside should be clear, not red or pink. 8. 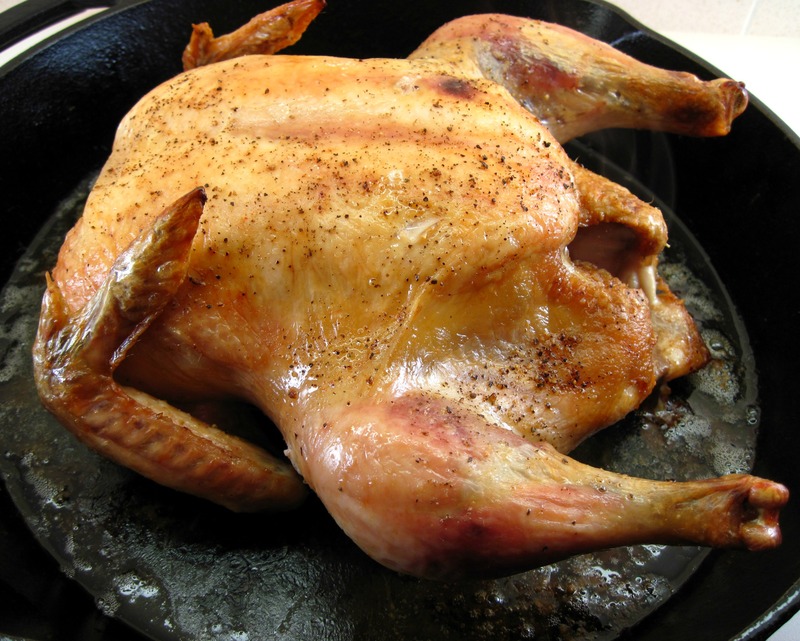 Remove the chicken from the pan to a cutting board or plate. Let it rest at least 5 minutes. 9. 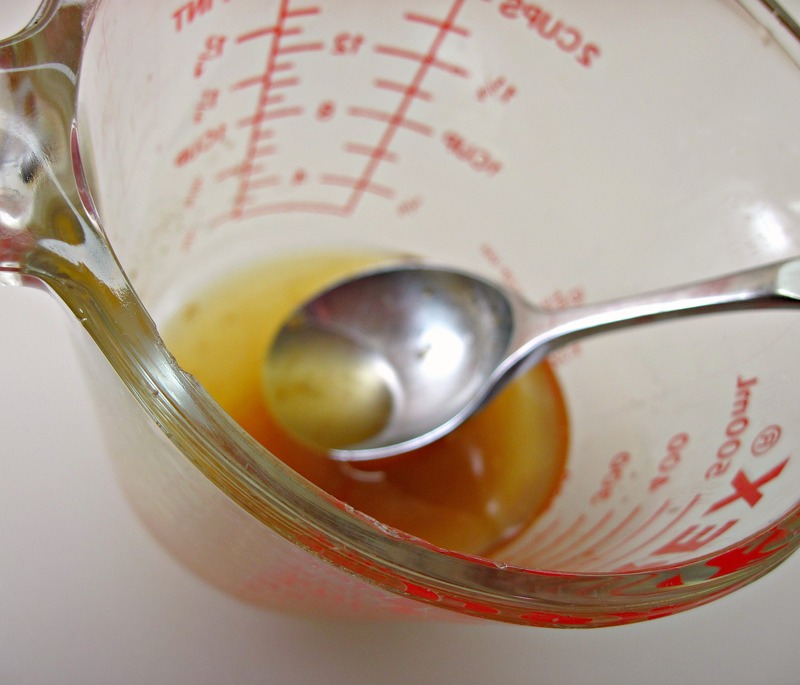 If you want to serve the chicken with the pan juices, pour the juices into a glass measuring cup. Let them sit for a few minutes to allow the fat to rise to the top. 10. Spoon some of the excess fat from the top of the juices. 11. Cut the chicken into serving pieces and serve with the pan juices. I love my Mark Bittman book. (I just have one.) I turn to it, every time I just have a hankering to, say, cook an eggplant, and need an idea. Great advice, always. One can never have too many cookbooks (I think)! This looks amazing! One can never have too many cookbooks, I think! Thanks for sharing this easy and perfect recipe! You know me…there are no such thing as too many books. AND I always love a roast chicken! I even make it in the summer (as you know summers are mostly mild anyway) and I love eating every last scrap and then using the bones for stock. 🙂 I can smell it now! Thanks for the motivation my friend! This looks easy and delish. I make mine with rubbed with mayo and it is knock your socks off fantastic. I used to be affraid to make roasted whole chicken and now I make them all the time. I will have to give yours a try.